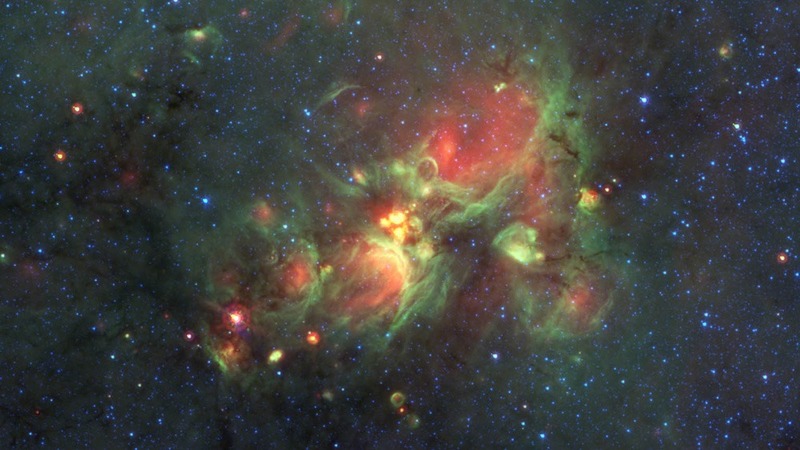 Astronomers gave the name “yellowballs” to the infrared objects the nonscientist spotted. The volunteer was working with The Milky Way Project, which farms out infrared-light images from the Spitzer Space Telescope. These citizen scientists go on line to examine the images, circling and classifying objects in each, such as bubbles of gas and dust inflated by emissions from young stars. The information helps astrophysicists process huge numbers of images to understand star formation. That got researchers’ attention. In a paper published on line in The Astrophysical Journal (and coming out in print soon), lead author Charles Kerton of ISU’s Department of Physics and Astronomy and others studied 138 of the about 900 yellowballs the Milky Way Project identified. By cross-matching them against catalogs of space objects and studying their luminosity and size, the scientists concluded yellowballs are compact star-forming regions. Yellowball regions are found in dense gas and their luminosity is consistent with that expected for a collection of newly formed massive stars. For more details, check out the ISU release. Later last week The Astrophysical Journal posted the second ISU-connected paper. This one came out of data from the Kepler telescope, a space-based instrument that hunts for exoplanets – planets outside our solar system. Kepler watches for subtle changes in a star’s brightness that may indicate a planet is crossing in front of it. It flags each such star for further study, usually with ground-based telescopes. Steve Kawaler, an ISU physics and astronomy professor, is part of a Kepler project committee focused on asteroseismology: stars’ inner rumblings, similar to the quakes and tremors seismologists study to learn about Earth’s innards. In 2013 I wrote about another Kepler paper involving Kawaler that described a star with an unusual tilt. The latest paper focuses on Kepler-444, a Milky Way star that’s about 117 light years from Earth near the constellations Cygnus and Lyra. It’s about 25 percent smaller than the sun and its five small planets are clumped together in orbits that are so close their “years” are less than 10 days. But what makes Kepler-444 really interesting is its age: an estimated 11.2 billion years, only a couple billion years newer than the universe. 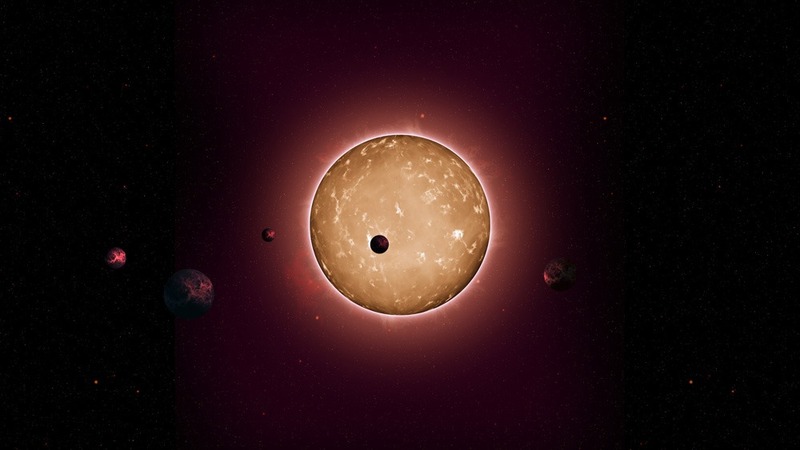 An artists’ conception of Kepler-444, a recently discovered star with at least five planets. The system is 11.2 billion years old, more than twice as old as Earth. Illustration by Tiago Campante/Peter Devine, from the ISU release. How do researchers know this? Asteroseismology, which studies the effect of sound waves trapped inside the star, causing its brightness to pulsate. Certain pulses occur with a regularity that changes with the star’s age, as this post on the science site Ars Technica explains. The Kepler-444 discovery shows planets have been a feature of the galaxy for a long time – long before Earth came into existence, Kawaler says in the ISU release. For more details, here’s the NASA release and one from the United Kingdom’s University of Birmingham, home of lead author Tiago Campante. The Kepler paper has received a lot of attention. The BBC even called Kawaler – rather than Campante, surprisingly – for an interview (starting at 52:35).